The Cedo cycle lock is a circular code lock from Danish origin that has been sold from the 1960s to 1980s in several countries in Europe and North America (at least). 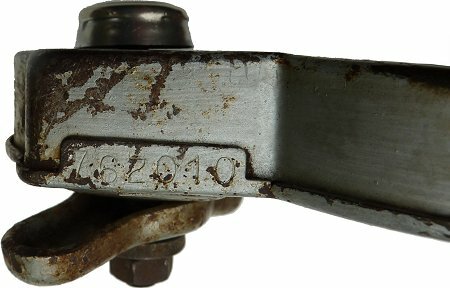 What makes this code lock special is that there are not multiple pins or rings that can be put in different positions to form the combination the open lock, but only one large reflector knob in the middle. This knob can be moved from the centre position in three directions: to the right, left and up. The combination to open the lock consists of several steps, and one step is formed by moving the knob in one of these directions for a certain number of times. Buyers of a Cedo lock got a miniature lock with the right combination mentioned on the backside. 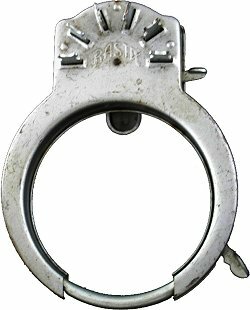 For thieves, it is quite difficult to find the code of this special lock with methods which would work with a standard code lock. Of course, the lock is not made of hardened steel so it would not withstand a serious try to destroy the lock. But back in the sixties it was still a sound remedy against casual thieves. The lock still appears here and there, most collectors know it. It must have been sold in fairly large numbers in different countries in Europe and beyond. Some time ago I came into contact with Ernest Wolf, the former importer of the Cedo lock for the United States. He had kept an original master code list from the manufacturer with the serial numbers and the corresponding codes of a part of the total Cedo production. For some years, Mr. Wolf had helped Cedo lock owners worldwide who lost the code with this list. On grounds of age, he passed this service to me (see below) and I delved into the backgrounds of this fascinating lock. The Cedo lock was sold in the Netherlands from 1961 on. Importer Philip Druijf from Amsterdam started in March of that year a series of advertisements in the bicycle trade magazine F4. The text said: "Cedo on TV - keyless bicycle lock - regarded by the police on television as the most reliable lock against bicycle theft. Unlimited number of possible codes. Your wholesaler has them in stock." Apparently the new bike lock even had appeared on television. Whether the introduction in Denmark, the country of origin, took place in 1961 or some years earlier is unclear, see also the chapter on patents. On the history of Cedo A/S itself much is unclear, such as the meaning of the name Cedo. Is it an anagram of the word "code"? The company was located in an industrial area in Bagsværd, some ten kilometers north of Copenhagen. 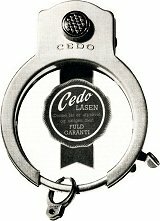 According to Ernest Wolf, the Cedo lock was the only product that was made by this company. The owner was Hans-Peter Sørensen with whom Wolf came in contact in 1965. This finally lead to the Cedo importership for the U.S. market for Wolf. The contact lasted until 1987 when the factory closed, the details of this closure are not known. The mechanism of the Cedo lock is based on a number of patents, mainly from the 1950's to 1970's, filed in Denmark, the USA and some other countries. 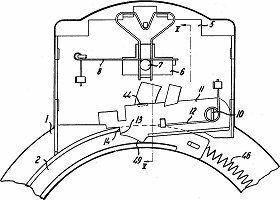 Looking at the accompanying drawings, the oldest patent that could be seen as a precursor of the Cedo lock is a Danish patent by Christian Albert Nørremark, filed on Oct. 26, 1945. In 1950 follows a patent by A/S Dansk Cykleværk "Grand" who resembles the Cedo lock a bit more. In continuation of this patent, the Danish Patent No. 82103 which was filed by "manufacturer Christen Christensen" from Copenhagen in 1954, shows very clearly the principle of the Cedo lock. On July 3, 1961, a Danish patent was filed which - according to the drawings - matches the Cedo lock that was introduced on the Dutch market a few months earlier. The patent specification refers to the patent from 1954, but also to that of the Dutch company Van Mouwerik & Bal for the so-called phone lock from 1919. Applicant of the patent from 1961 is the Danish manufacturer Basta Låsefabrik A/S from Copenhagen, while on the application for the same patent for Switzerland in 1962 Christian Albert Nørremark is listed as the inventor, who apparently worked for Basta. Bicycle collectors usually know Basta - founded in 1936 - from a circular code lock from the 1950s with six pins that had to be pulled out or pushed in. The housing of this lock is almost identical to that of the Cedo lock and has the same dimensions. 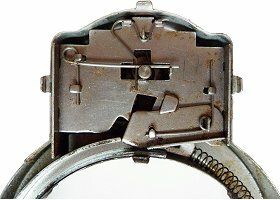 I do not know if there is any similarity between the inner mechanism of this lock and that of the Cedo lock. By the end of 1968 there was another improvement of the Cedo lock. The Danish patent was filed by Poul Martins from Copenhagen. In 1969 followed the corresponding patent application for the U.S. (U.S. Patent No. 3,602,021). Around the same time, Basta started selling the Cedo lock on the U.S. market under the name Basta Automatic. N.B. : At that time Ernest Wolf already imported the Cedo lock, produced by Sørensen in his Cedo factory. Looking at all these facts, confusion about who invented and produced the Cedo lock is complete. Basta and Cedo, two different Danish lock manufacturers, produced an identical lock which seems to have been invented mainly by Basta (staff). After the precursor of the Cedo lock being sold in the 1950s under the name Basta, the "real" Cedo lock with the sliding knob was first marketed under the name Cedo and after a couple of years under the name Basta, too. This story doesn't sound very logical, but to find out the true history research in Denmark would be necessary. Finally a word about the numbers stamped on Cedo locks. Some of the locks have a six-digit serial number on the side. Presumably these are the older locks from the 1960s. For most of these numbers the above-named master code list applies. Moreover some serial numbers have one letter and five or six digits. More frequently one can find locks with a serial number of just two letters. Locks with the same two letters open with the same code. On the backside of these locks there are numbers which indicate the month and year of manufacture, plus sometimes a patent number. If you don't know the code of your Cedo lock you can open the lock by bending the small tabs on the backside open with a screwdriver and remove the rear cover. (If the lock is still on the bicycle, you can remove it now.) Most of the lock mechanism is still hidden but by moving the knob, looking and listening well it is possible to find out the combination. How can I figure out the code of my Cedo or Basta lock? - Include the serial number of the Cedo or Basta lock in your e-mail. - Explain your situation: Why have you lost the code, how did you acquire the lock etc. - Send a clear picture of your Cedo or Basta lock and serial number. If the lock is mounted on a bicycle, please take a picture of the complete bicycle, too. Please be so kind to have a look on the backside of the lock - are there any codes or numbers stamped in? If so, mail these details or send a picture. This is not strictly required but would just help me to get to know more about the total production of Cedo and Basta bicycle locks. The master code list mentioned above does not cover all Cedo and Basta locks ever produced. This is why I will not be able to help everybody with his/her request. If nothing helps and you don't know the code of your Cedo lock, don't destroy the lock but open it. Simply bend up the lips on the backside and take the rear cover off. If the lock was mounted on a bike, you can now take it apart and remove it. Move the knob and observe the toothed wheel in the centre of the mechanism. After some time you should be able to make an educated guess as to the combination. Have you got any additional information about Cedo or the Basta lock? Then please send an e-mail.